Credit Card Advice: Are Credit Cards a Good Choice for YOU? Are Credit Cards a Good Choice for YOU? Credit Card Advice from an insider! Discover the inside scoop from a former Bank President! Hear the answer from an insider in the world of finance. Edward F. Mrkvicka is a remarkable man. chairman of the board of a national bank in America. Ed's financial books have made him a sought-after guest on numerous radio and internet talk shows and he's been featured in publications such as USA Today, the Boston Globe, Consumer's Digest, the Chicago Tribune, and the Chicago Sun Times. Hi Ed. Thank you for allowing me to interview you. My audience is eager to gain wise credit card advice. We all know that credit cards are relatively easy to get and easy to use. We all know how convenient they are, but we want to find out from you if they are a good way to purchase items and services. Should a person have a credit card, and if so, should he or she have more than one? People should have one credit card that they carry for emergencies only. The reason being, borrowing money via a credit card is one of the most expensive ways to borrow - and that’s what you’re doing when you use the card. Using too many cards is financial suicide for most people, as it makes borrowing money just too easy. And, of course, the more cards you have, the easier it is to lose track of what you owe - which is why so many couples are stunned when they get all their credit card bills at the end of the month. Here’s a rule of thumb that should never be broken - don’t borrow money (meaning don't use your credit card) for everyday expenses. That is usually a telltale sign that your finances are in deep trouble spelled with a capital T. Virtually everyone who files bankruptcy has a long list of credit cards they’re using. It’s a financial road sign that shouldn’t be ignored. Is your credit rating helped by using credit cards? Not really. Normally the more cards you use the worse your credit rating. Not because of the number of cards itself, but what the large number of cards represents - and eventually leads to. Some young people will go out and open a number of cards when starting out in life, in the hope that it will give them a credit history. This is OK, provided you use them to establish a history only. If you actually start using them, you’re in trouble…or soon will be. What about cards that give you perks? Do you think the credit cards that give cash back, or points, etc. for using a credit card are wise? Banks and credit card companies do nothing that is not profitable to them and them alone. Point being, any giveaway, “deal,” or promotion is designed with one thought in mind - to separate you and your money. Don’t get caught up and think you’re going to make money by borrowing money, because it isn’t going to happen. Stick to the plan. Have one card that you use only in emergencies. A fact uncovered through research for one of my financial books is that by sticking with “the one card left unused” theory, the average family will save somewhere in the neighborhood of $100,000 during their financial lifetime of 50 years. How can that be? Because in paying with a credit card that is not paid-off each month, you have substantially added to the retail cost (via interest) of whatever item you purchased. The question is, why would you want to pay more for an item that was probably over-priced in the first place? Sadly, many people are still paying a monthly credit card bill that includes items that long since stopped working and were thrown out. In short, credit card usage is not a viable way to increase your net worth. Quite the contrary. Are there any advantages to using Credit Cards? Are there advantages to using credit cards? There is one advantage to using a credit card for a major purchase; i.e., it gives you leverage with the seller should the merchandise be faulty. Quite often when we have a problem with a merchant, he holds all the cards, as he’s made a sale and now has your money. But if you’ve used a credit card, you can contact the card company and ask that they withhold payment to the merchant until the dispute is resolved. As the merchant needs the card relationship to do business, they are almost always helpful once they understand their dispute is no longer just between them and a disgruntled customer, but with the bank or card company they must keep happy. However, as soon as you’re reasonably certain the merchandise is as advertised, pay-off the entire amount and move on. What about the free cards vs. the ones you pay a yearly fee? It is always cost effective to find a card that doesn’t charge you interest if you pay-off the entire balance when you receive your bill. There aren’t as many of these cards as there used to be, but they’re out there. Do a little homework, as it’s well worth the effort. Another rule of thumb - know the nuances of your card - when are balances interest free?, - when is the balance due?, how is the interest computed?, when does it start accruing?, etc. In my banking career, and in doing research for my financial books, I have tried to ask as many people as possible these questions, and you know what? Most people have no idea what they’re paying - not a clue. Of course, in no small part , this is because your credit card agreement is written in bankerese, which is used to ensure most credit card customers are at the mercy of the credit card company. This should get your attention. Any time you enter into a financial agreement written by the other party in such a manner that no non-lawyer type can understand, perhaps you’d better be on-guard. Helpful credit card advice tip: If your card has a yearly fee attached, call your credit card company and ask that they waive it. Most of the time they will, as it’s cheaper to hold on to you than find another customer to replace you. How should I pay for Groceries? For daily or weekly purchases such as groceries (or paying a company to do a service for your house such as a plumber) do you suggest using cash, a debit card, or writing a check? As noted previously, I recommend that you pay cash for all daily expenditures, as long as you ensure you get a receipt that clearly indicates the amount you paid and for what service/purpose. A side note - debit cards are dangerous as married couples in particular often run-up overdraft charges because one spouse doesn't know what the other has done financially as it pertains to their checking account. Then too, the bank has once again made it too easy for you to perhaps buy things you don't really need. There is a completely different mindset when you pay cash - cash is cash, and everyone understands that, but when you use plastic it doesn't seem like you've actually paid anything for the merchandise, when, in fact, you have. Is it dangerous to use a credit card at a restaurant? 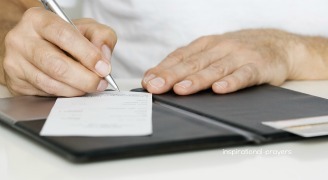 Is it dangerous to pay a restaurant bill with a credit card because of the possibility of a dishonest staff person gaining access to your credit card number information? Identity theft is a growing problem in America, and one of its critical facets is that people use credit cards far too often. Each time you do you are giving a potential thief access to your account number. Yet another reason to pay cash whenever possible. this important and powerful information. We all need to be open to wise credit card advice. Ed Mrkvicka is a lay minister/counselor and award-winning Christian writer. Prior to his Christian writings he was, at one point in his banking career, the youngest bank president and chairman of the board of a national bank in America. His financial writings are focused on personal banking, the stock market, and personal finance. In addition to writing awards, his financial writings have been used to teach college courses at a number of universities. Ed Mrkvicka is a personal friend of Beth McLendon and a part of the Inspirational-Prayers team. He is praying that those who visit our site will be blessed, and that they will catch the vision for living debt free and reach their goal of financial freedom.